It has been quite a while here in this blog lately, but it does not mean that nothing is happening. I am working on an interesting performance project with a singer and a sound recorder. This performance requires quite expensive equipment, so we need to get external support for financing before we can continue further. However, this project has made me study more deeply programming languages such as Processing, VVVV and Pure Data. In the mean time I have continued in my other project where I will make "an audiobook" of my own. For this project I need to have loudspeakers that are as flat as possible. This has proven to be quite difficult task. Passive speakers as such are not a good option, because Arduino (+ Mp3 player) will not be able to feed enough power to them. You can get some signal out, but the sound is so silent that it is practically useless. I tested several passive speakers with Arduino/MP3Trigger and the results were poor. Therefore I needed to have some kind of powered amplifier to get reasonable loud sound out of the system. I could have tried to make a powered amplifier by myself, but it would not be flat enough for my purposes. Then I finally remembered that what I need was actually already in my storage !! 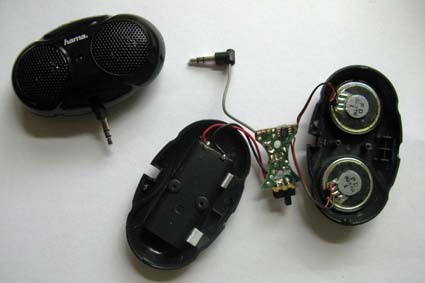 Cheap, ready-made speakers intended for MP3 players. I had bought some HAMA loudspeakers couple of years ago. At that time, I was not satisfied them, because they were too bulky. Because I was not using them, I though it does not matter if I broke one down to see if there is something useful inside. The lessons learned could be that tinkering your old useless gadgets might be more worthwhile that buying new stuff. p.s. While looking for some help from internet, I found interesting link that showed how to make very flat loudspeaker from fabric. Although they are not very practical to my "audiobook" project, I will definitely try making my fabric speakers in the near future.